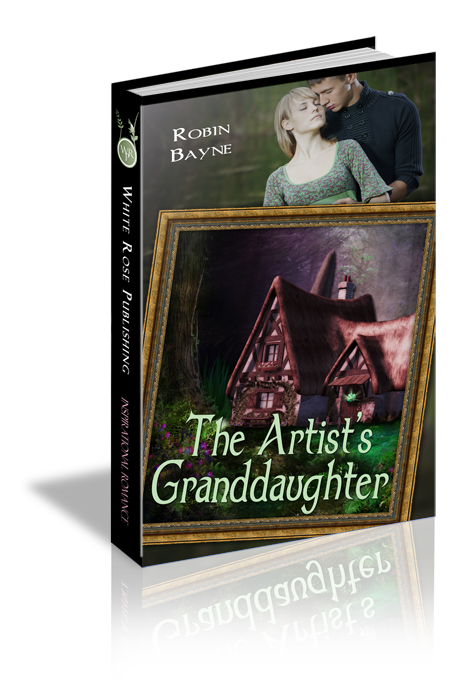 When Megan bids on her grandfather's painting, the last thing she expects is to be outbid by Michael Kirk, her first love. He left town years ago leaving her reputation--and her heart--in tatters. She must keep her grandfather's final legacy in her family, but Michael claims to need it for his career. He also claims to want Megan back in his life, and her betraying heart doesn't mind the idea...but does Michael want her or the painting? Megan swung to face the stage again, her heart thundering in her ears. Tilting her head up, she pretended to study another picture, willing the tears to stay in her eyes and not add to her humiliation. She’d lost Granddad’s painting. At the very least, she hadn’t lost it to Debbie Grimes. But Michael? He hadn’t shown his face in Carroll County in a dozen years—and back then, he’d been a long-haired kid in jeans and leather. Just like she had been. Sighing, Megan turned slightly and looked to where he had stood, but he wasn’t in sight. It had to have been him. Her nervous system confirmed it, even though the well-groomed man who outbid her wore a dark grey suit and tie and didn’t resemble the scruffy teenager she remembered. So why did the grown up Michael want the oil? Around her, the auction went on. Men and women dressed in their finest moved around the warm gym fanning their faces with the auction programs. Auction staff lifted art onto the display easel. The auctioneer started another bid. As a huge Tarkay print of sophisticated ladies went up for sale Megan thought she should leave. There was nothing else here for her to bid on. The one thing she’d come for, the only thing that had any meaning, had gone to the highest bidder and it hadn’t been her. Megan’s heart pounded to match the falling gavel. She could talk to Michael and maybe convince him to sell the painting to her. Approaching him would be uncomfortable, but they were both adults now, and she could perhaps explain the situation. Surely, he would remember how close she was to her grandfather, and if he only knew why she needed to own the painting, surely he’d sell it. Of course, he’d want six thousand for it. He couldn’t be expected to take a loss. Somehow, she’d come up with the extra grand. Slowly she made her way to the back of the gym, nodding to acquaintances as she went. Would any of them recall the gossip about her and Michael? Had any of them believed it then? An elderly lady in a wool coat and purple Fedora smiled at Megan as she grabbed her own coat from a metal rack. Would Mrs. Pemberton still be smiling if she knew Megan was about to try and charm Michael Kirk? The restroom door opened and Debbie appeared, which placed both women at the outer doors simultaneously. Megan hung back a pace and let Debbie go through first. Debbie wouldn’t meet Megan’s steady gaze, but pushed forward, then stopped suddenly, and Megan nearly collided into her. “Michael!” Debbie had stopped to gawk. Michael leaned against one brick wall, a leg propped up like a cowboy lazing around the ranch, his arms again crossed in front of him. He smiled, but regarded Debbie with little apparent recognition, instead turning toward Megan as she pushed past the brunette. “Megan,” he said, gaze intent as he dropped his foot and straightened. “You look great.” He sounded surprised, whether at seeing her, or at the chance to talk to her, she couldn’t tell. The words were so soft she had to move closer to hear him, and she noticed from the corner of her eye that Debbie was stalking off. “Hello Michael. You’re looking well yourself.” Inwardly she winced at her choice of words. After everything they’d shared, “looking well” sounded lame. But her stomach was not cooperating, it was alive, fluttering; words were trying to change font or something on the way from her brain to her mouth. “I didn’t expect to see you tonight. You don’t still live here?” Hands shoved deep into his trouser pockets now, Michael looked every inch the rugged guy she’d known so well, just in smoother wrapping. “I’m afraid so. Never left.” Not that you’d know that, she thought, not wanting to speak the words and sound bitter. He shook his head but the soft brown hair, cut shorter than his high-school shagginess, scarcely moved. She remembered it longer, tickling her cheek when he’d bent his head close to hers. Megan realized he was staring, probably waiting for her to speak. What had he said? The October night air became a cold cloak around them and she swallowed hard. “I have a little shop in town,” she said, “but most of my business comes from Baltimore.” Would he remember her interests or just assume she sold flowers or dry goods? “How about you?” The wind picked up, pushing strands of hair into her face and tickling her neck. Setting her purse on a low brick wall, she wiggled into the coat she’d forgotten to put on. Cheers rose from inside the gym, and Megan remembered why she’d approached Michael. “Would you like to get a cup of coffee? I’d like to talk to you about something.” She shivered, a bone-chilling spine shiver, and wondered if coffee with the man who’d broken her heart was such a good idea. But this was far too important. “Megan,” he said as the doors swooshed open. He yanked her from the path of a large frame being carried to the parking lot. “I don’t think that’s a good idea.” He stepped back from her, but held her with his gaze. She’d always loved the blue-green-gray of his eyes. Mood eyes. She wrenched her arm free. “My parents have been dead for seven years, Michael.” Her pulse raced with apprehension now instead of excitement. She had to speak with him about Granddad’s painting. “And no one here even knows about what happened thirteen years ago.” Forcing her voice to a steady, calm pace, she kept eye contact with him. She saw the change in his demeanor by the color of his chameleon eyes, the angry green fading to a docile grey. Michael closed his eyes briefly, then opened them, nodding his agreement. “OK, just coffee. I certainly don’t want to be the reason you’re mangling this little lip.” He reached out and traced her lips, gently, staring down at her. Megan licked the lip she routinely used as a tension outlet. Funny he’d mentioned it. He should have seen it thirteen years ago. Warming in the wood-decor cafe, Megan clutched her ceramic mug like a lifeline. She eyed Michael across the paneled table, taking in how the years had changed him. Matured him. Made him even more handsome than she’d remembered. What was she doing? The last thing she needed was to be seen in public with him, let alone in the small town’s only coffee shop, drooling over a man like him. With a reputation like his. A man she had a past with, one whom some of the older members of the community would remember with distaste. She could still picture their disapproving faces. The scent of cinnamon drifted over from the next table as the waitress delivered hot pastry, drawing Megan’s attention from the past. “Megan Marie Roberts,” Michael began, pushing back in his chair as he set down his mug. “I’d never expected to see you again. Or if I did, I would’ve thought you’d be married with three kids and traveling around in a wood-paneled station wagon. No, this is the twenty-first century. A mini-van.” His grin eased his words. Her cup clanked on the table. “You knew you were bidding against me?” She sat straight in the wood chair. Why had he bid on her painting? Megan smiled, shaking her head at his attempt to change the subject. But she was proud of her work, and eager to tell him about it. Michael grinned as Megan’s cheeks fired up. Didn’t Lisa know who Michael was? Chattering on, the waitress left for another table, patting her ponytail as she went. “Yes, you did. You meant it, but that’s OK. I resemble that remark.” Michael fished in his pocket and tossed a twenty dollar bill on the table. Wondering if her face could possibly explode from the blood flood, Megan dabbed at it with her paper napkin. “No, we lawyers make a lot.” The look he gave her said it all. Her derogatory comment had offended him. “My timing’s never been the best,” she went on as Lisa came to collect their cups, grabbing the paper napkins and empty creamer containers. “Sounds interesting.” He tilted his head to indicate she should move toward the door, away from listening ears. Could that eyebrow arch any higher? “I’m sorry, Megan.” His voice was soft, gentle. A1. Bolts of dislike struck the back of her head, but Megan faced forward, sat straight, felt the collar of her dress scratching the back of her neck. She studied the works of art at the front of the room, ignoring Debbie’s gaze boring into her as if today was just another day here at Carrolton High. Debbie had stopped speaking to her in the tenth grade, and now, thirteen years later, the first time Megan had been back in her old school, the woman was shadowing Megan’s every move. . . .
"One thousand," Megan said, after someone’s bid of nine hundred, and she emphasized the thousand. Her pulse quickened. This piece would be going home with her tonight, no matter how high the bidding went. "One thousand from the pretty lady with the gold hair." He paused and listened. "Eleven hundred, do I have twelve? Twelve? Twelve hundred?" Megan nodded. The auctioneer had pointed to someone behind her again, and Megan turned to look, searching for another elderly person who liked the painting. She wanted to stare him down. Q--Have you ever had a friend disown you, without you knowing why? Did the animosity continue for years? How did you deal with it? Were you ever able to forgive? Q2. Excerpt: "So, the theater?" She wanted to break the personal contact, to return to small talk. "Yeah. Seems my boss heard it’s up for sale, and he’s getting ready to retire. So it’s to my advantage to help him out." "Your boss wants to fix up the Grande? Cool." He nodded, then shook his head, matching Megan’s pace as they continued down the street, positioning himself on the road side of her. Several more cars blew by them, and he waited until they passed to speak. "He just wants to re-sell it, that’s what he does. He’s not planning on re-opening it. Sorry." He coughed, and Megan wondered if he felt bad about his news. The shoe salon was to their left, and the theater sat just beyond. They crossed the street and approached the old place, looking at it from the sidewalk. "Feeling adventurous?" he asked, indicating the building with a tilt of his head. His grin made her heart stop, just like it always had. Q--Jesus tells us there are mansions of many rooms waiting for us in Heaven. Are there earthly places that stir up tender feelings and longings for you--knowing they are only shadows of how wonderful our place in Heaven will be? Q3. Michael and Megan are reunited in this story, they seem to share true love. Why does the Bible say man and woman are meant to love each other? A3. A relationship between man and wife is a foreshadowing of the relationship we will eventually share in Heaven as the bride of Christ.